NISA's Tips & Tricks - Touhou Genso Rondo: Bullet Ballet (Part 3) | NIS America, Inc. These two characters really epitomize the two things that make Touhou Genso Rondo special: bullet-hell and fighting! 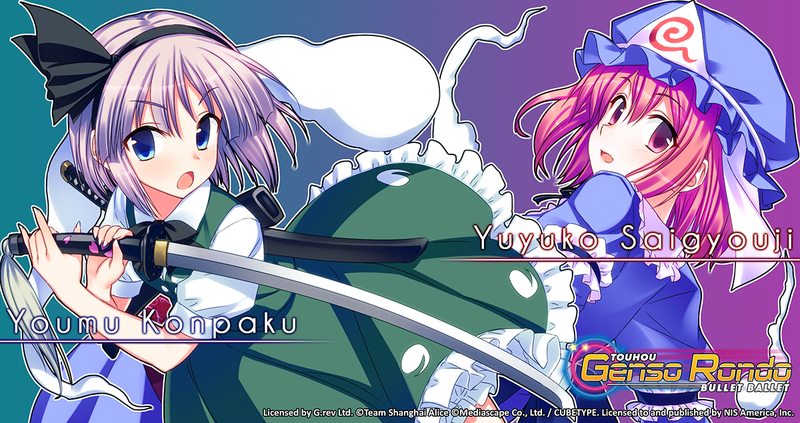 I can’t talk about Youmu without mentioning Yuyuko, so let’s start with her. Yuyuko is a ghost princess who throughout the Touhou games has ended up with a bit of a reputation for being an airhead - but how could you not be if you’re a ghost?! (Get it???) Anyway, her ghostly presence comes with some cool benefits, like the phantasms around her causing super cool effects and letting her truly shine in Touhou’s bullet-hell world with a dazzling array of projectiles. As you may have learned already, you can use the X, O, and Triangle button to launch attacks in your bullet ballet, but you can also use L1 and R1 to modify those attacks. Yuyuko’s unmodified attacks give you a nice variety of attacks. You get a good mix of targeted and large area projectiles from Yuyuko's unmodified attacks, as you can see. (I personally love the last attack used in the .gif - so many colors!) When you modify her attacks with L1, you'll get the moves you see below. (Again, colors!) L1 will make your character move considerably slower than normal, but it also lets you 'graze' your enemy's projectiles to quickly build up your charge meter and toss out more of those awesomely colorful Triangle button attacks. As you can see, slow move does some cool things to your projectiles with Yuyuko. The green floating phantasms are the modified version of your standard attack which changes their distance and can force your opponent to change their course right into your other attacks! Then, there's the Ricky Bobby style, "I wanna go fast!" Modifying Yuyuko's attacks with R1 will make them a bit more awe-inspiring. The first attack you'll see below is one I had already cast which has a nice AOE and moves around to new areas if it misses its target - again, keeping your opponent on the move. You can always follow that up with a few homing projectiles and then blow them away with a couple mighty charged attacks from the trusty Triangle button! That pretty much exhausts all my insights for Yuyuko, and brings me to my absolute favorite character to do the bullet ballet with: Youmu! A half-human, half-phantom gardener who also happens to act as bodyguard and fencing instructor seems like just the kind of person you'd want to dance the bullet ballet with, right? Most important - to me anyway - is the fact that she's rocking two katanas. If that's not just begging you to get in close to slice-and-dice in this bullet-hell fighter, then I don't know what'll convince you! Youmu's got a lot of awesome stuff up her sleeve, and slicing-and-dicing definitely play a big role in her kit. In this first little .gif I've put together, you can see that you can make use of your slow move to graze and build up Charge, which you can then expell in short bursts to literally slice the space around you and create passive attack waves. Since this move doesn't use up a lot of charge, you can actually get six slices out with a full charge. If you're as quick as I think you are, you'll have noticed the quick back-and-forth attack at the opening of the .gif. This is a nice AOE attack that let's Youmu punish her opponent in the mid-range - generally before they're close enough for melee, but also where focused attacks are easier to dodge. Then, there's what I consider to be Youmu's biggest strength - her speed and mobility. Youmu's dual katanas make me want to get in people's face, and Youmu is perfect for that. She's great at dodging incoming attacks, and as you'll see in this next .gif, she has the ability to close the gap instantaneously to dish out damage. WAM-BAM-Sliced-your-face-MA'AM! Phew. Okay. I've calmed down now. Just make sure you don't recklessly charge in since a good opponent may just counter your melee attack! And with that, my fine Prinnies, I have exhausted my insights. Look out for my buddy Chris’ tips next week - he’s been a competitive member of EVO for Street Fighter for the past few years, so I’m sure there will be a few cool tricks up his sleeve for this bullet-hell fighter! Be sure to check out all Robbie's insights and Jupy's tip blog if I didn't discuss your favorite Touhou lady, and visit the game website to see the full roster that'll be blasting at you this September! Jump in the comments below to let us know which character you’re looking forward to playing as, dood!